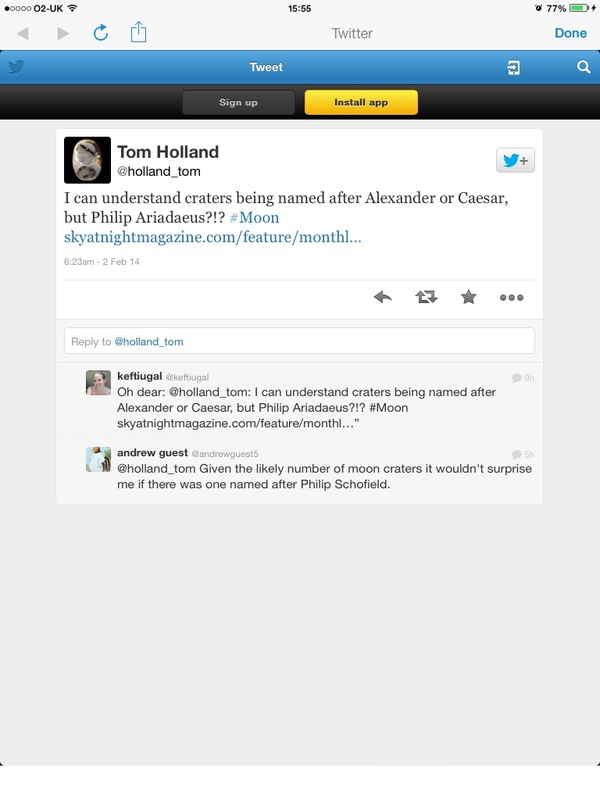 This morning on Twitter I read the following tweet by historian Tom Holland. You can follow his link to The Sky at Night’s webpage here. I have to admit, I share his scepticism. Arrhidaeus’ claim-to-fame is really just the fact that he was Alexander the Great’s (half-)brother. Apart from staying alive as long as he did Arrhidaeus didn’t really do anything to be worthy of great honour. To be fair, he wasn’t best placed to, having some form of (mental?) illness as a result of being poisoned by Olympias when he was just a boy (Plutarch 77). Perhaps whoever decided to name a crater after him was not thinking of Arrhidaeus as one of the great men of old worthy of remembrance but as a disabled man who deserved recognition for what he unfairly suffered. The list comes with the usual provisos – as useful as Wikipedia is, it can sometimes be unreliable; and, of course, I may have missed someone out. By-the-bye, as I went through the list I was struck by the fact that there appeared to be very few Roman names mentioned. Yet, if you click on the link to The Sky at Night‘s webpage, you will notice that Arrhidaeus’ crater is located close to one named after Julius Caesar. As I said, Wikipedia can be unreliable.